JWST100/RELI 123: Intro to Jewish studies. HS/GL | M-W 1:25-2:15PM. Andrea Cooper. Recitations: F 12:20pm-1:10pm, F 1:25pm-2:15pm, F 3:35pm-4:25pm. RELI 063: Archaeology of Qumran | M-W 5:00-6:00PM. Jodi Magness. 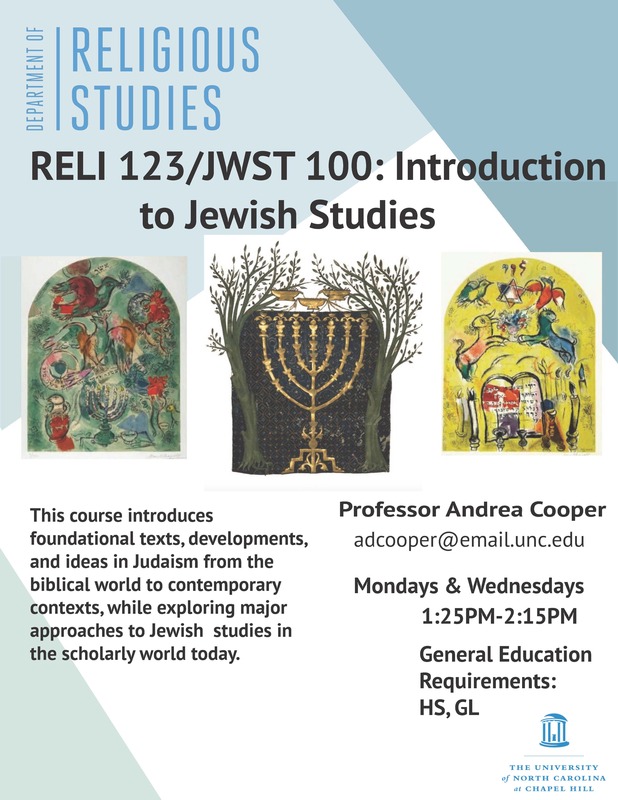 JWST/RELI 103: Introduction to the Hebrew Bible/Old Testament Literature | M-W 12:20-1:10PM. David Lambert. 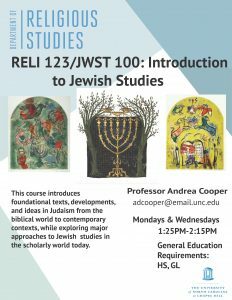 JWST/RELI 106: Introduction to Early Judaism | M-W 1:35-2:15PM. Jodi Magness. 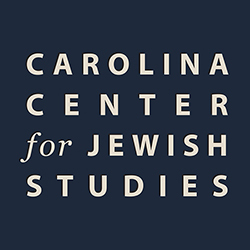 JWST/RELI 420H: Post-Holocaust Ethics and Theology | M 3:35-6:25PM. Andrea Cooper. 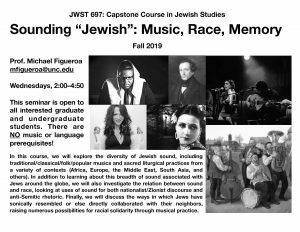 JWST/RELI 444: Gender and Sexuality in Contemporary Judaism | Tu-Th 9:30-10:45AM. Yaakov Ariel. 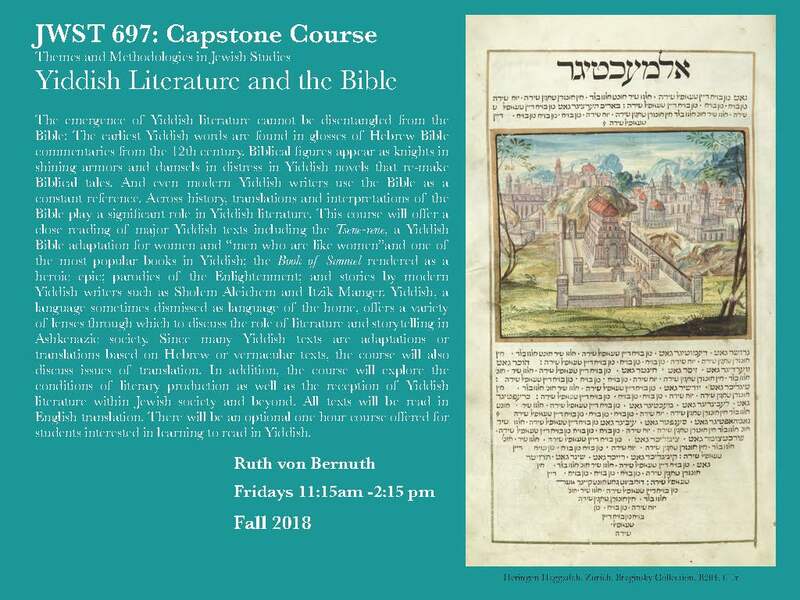 JWST 697: Capstone Course: Yiddish Literature and the Bible | F Ruth von Bernuth. 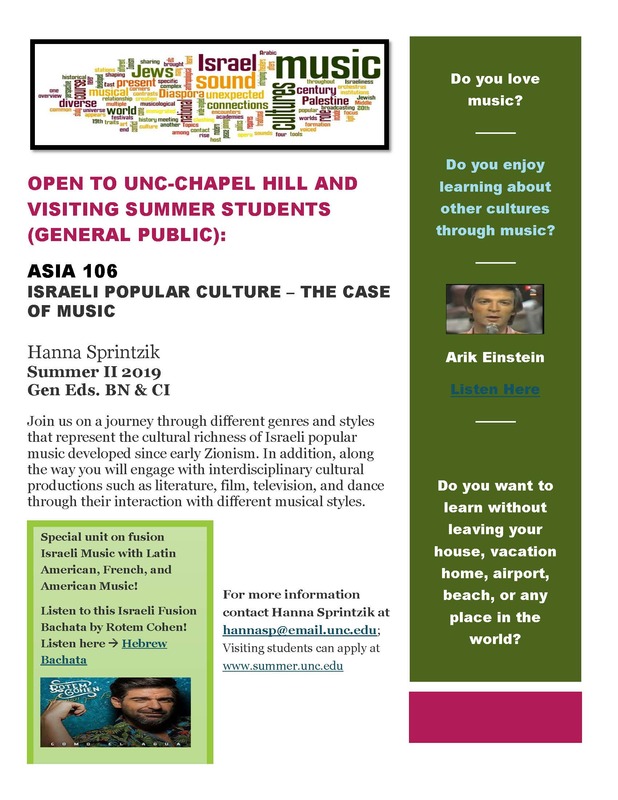 MUSC 286: Music as Culture: Music, Sound, and Religion in the Middle East and North Africa | M-W-F 11:15AM-12:05PM. Michael Figueroa. HEBR 101: Elementary Modern Hebrew I | M-W-F 9:05-9:55AM | M-W-F 1:25-2:15PM. Ana Sprintzik. 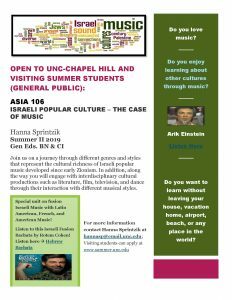 HEBR 203: Intermediate Modern Hebrew I | M-W-F 10:10-11:00AM. Ana Sprintzik. 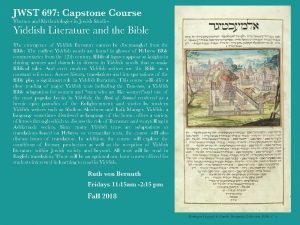 HEBR 305: Advanced Modern Hebrew I | M-W-F 12:20-1:10PM. Ana Sprintzik. 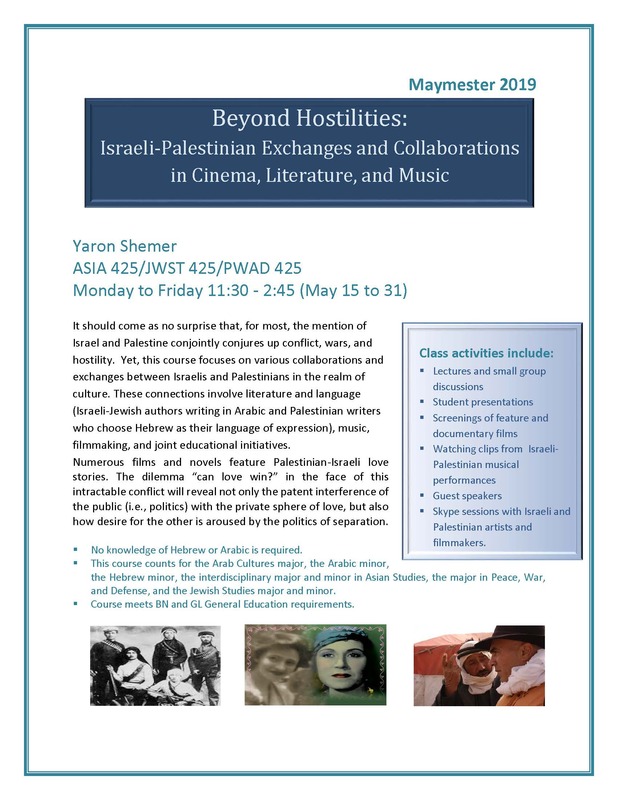 RELI 242: New Religious Movements, Yaakov Ariel. RELI 542H: Religion and Counter Culture, Yaakov Ariel. RELI 812: Diaspora Judaism | Jodi Magness.